This is an amateur game (1995 Swedish Championship). The play would never occur in pro play: at or a can be considered compulsory. 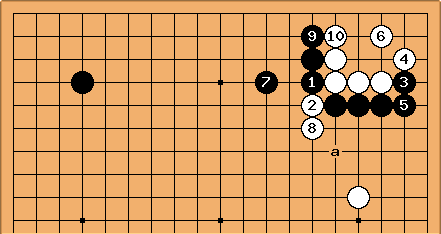 The hane play is excellent shape and bends back White's position on the upper side: if we had next here the reasonable White b, Black c, White d, Black has advanced by ninety degrees in this focal area compared with at . In this shape you are supposed to look at the white wall. There might be another black stone at the circle point, or the square point. The stones were going in one direction (south), The stones are now going in another (east). 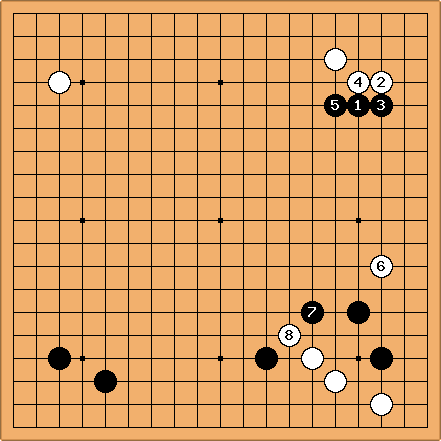 The effect is that Black gets 270 degrees, White only 90 degrees of the outside influence here. This is a bad result for White (appalling is hardly strong enough to express how bad). The same joseki in Yamabe Toshiro-Hashimoto Utaro 1963-03-30. is tenuki to match tenuki from the lower right. It does however cede influence. 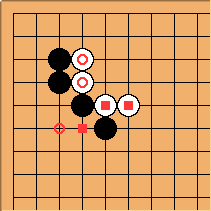 Black builds up influence in the upper right, ending though in gote; so White can continue at . NB that Black a remains as a substantial endgame play. In general tenuki plays can lose influence in this way, and this is to be taken into account even if the temporarily abandoned group has no problem surviving. HolIgor: I've never played it before but seemed too important. White replied with . seemed like a good idea. took me by surprise. I gave in with . Yet was a good move. 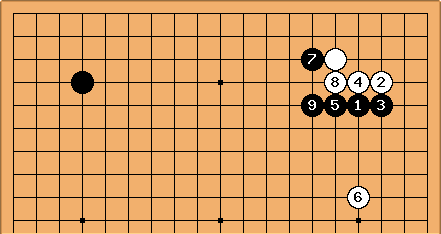 Black then jumps out with a. Yoshida gives other variations as well. It is so easy to mess up in this situation. How can one risk this unprepared? Next time I will play this to see what kind of fight results from here.